The beautifully illuminated trees in blazing red are breathtaking! There are an amazing number, roughly 1000 Japanese maple trees here! Admission fee: JPY 400 for adults; JPY 200 for elementary and junior high students. Togetsu-kyo Bridge, one of the important landmarks of Arashiyama, is illuminated in the evenings and it appears completely different from that of the daytime. If you have time we recommend you to see both. There are about 3000 trees, including Japanese maple, Yamamomiji maple, and Omomiji maple, planted within the site of Eikan-do Zenrin-ji Temple. The view of the illuminated maple trees is breathtakingly beautiful. The view of the reflections of autumn leaves on the surface of Hojo-ike Pond along with the illumination is mesmerizing enough to make you lose track of time. Kyu Saga Gosho Daikaku-ji Monseki is a former imperial retirement villa originally built for Emperor Saga back in the 7th century. It is known as where Saga Goryu, one of the prominent ikebana (flower arrangement) schools, originated from, and the autumn leaves surrounding Osawa-no-ike Pond are very beautiful. In addition, the reflection of Shingyo Hoto pagoda and autumn leaves on the pond’s surface creates a fantastic world. Nison-in Temple features a tunnel of maple trees which extends about 100m. 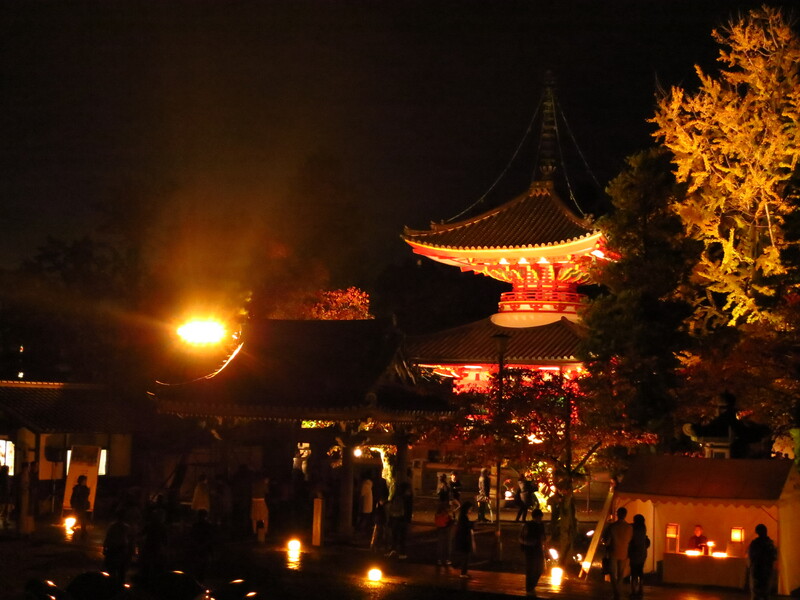 The temple is also referred to as “Momiji-no baba” (riding ground of maple leaves), and is designated as a cultural asset by Kyoto. Make sure to enjoy the autumn leaves both in the daytime and the evenings!